Our magnetic horse boots have been vet-designed and developed to offer magnetic pain relief and to help your horse recover from lameness or exercise. This boot covers the hoof, coronet and navicular regions. 900 gauss strength per magnet. 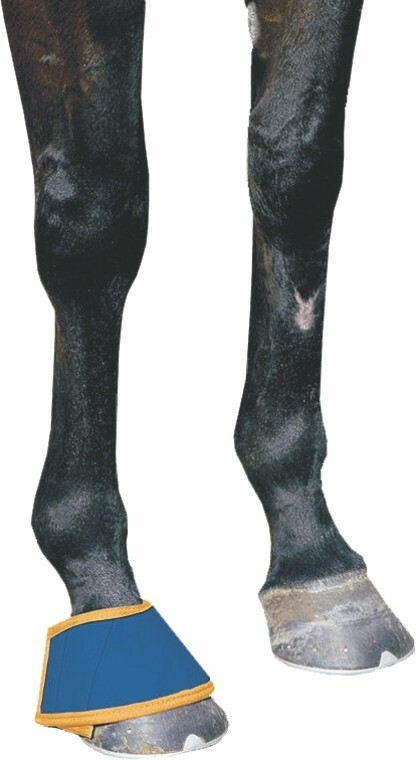 Magnets strategically placed to envelop the hoof, coronet & navicular regions in a rich magnetic field. For general use no harm is done in using the product 24 hrs a day, although we recommend it be taken off periodically to clean and to allow the skin a chance to breathe. Special care should be taken when the product gets wet . Moist skin can in time become infected. Best results are achieved when the product is used for a minimum of 4 hrs a day and left on for up to 14 hours a day, with a few hours break in between. Please note; this product is not designed to be left on the animal while outside for long periods of time. Dirt, caked mud and moisture will quickly diminish the product lifetime and possibly void warranty. Keep the product dry and free of dirt, mud or anything else that may deteriorate or destroy the product.